Proper brake hose routing is essential to insure safe vehicle operation. Refer to "CABLE ROUTING" on page 2-33. 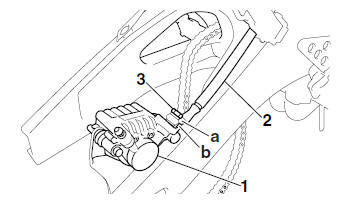 When installing the brake hose onto the brake caliper, be sure to position the brake pipe "a" into the slot "b" in the brake caliper. Rear brake caliper Refer to "REPLACING THE REAR BRAKE PADS" on page 4-33. Use only the designated brake fluid. Other brake fluids may cause the rubber seals to deteriorate, causing leakage and poor brake performance. Refill with the same type of brake fluid that is already in the system. Mixing brake fluids may result in a harmful chemical reaction, leading to poor brake performance. When refilling, be careful that water does not enter the brake fluid reservoir. Water will significantly lower the boiling point of the brake fluid and could cause vapor lock. Brake fluid may damage painted surfaces and plastic parts. Therefore, always clean up any spilt brake fluid immediately. Brake system Refer to "BLEEDING THE HYDRAULIC BRAKE SYSTEM" on page 3-20. Brake fluid level Below the minimum level mark "a"
Add the recommended brake fluid to the proper level.